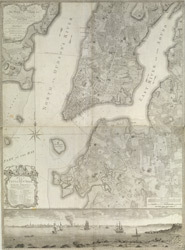 Plan of the City of New York as it was in 1766 and 1777. The plan was drawn by B. Ratzer a Lieutenant in his Majesty’s 60th (Royal American) Regiment of Foot, better known as The King's Royal Rifle Corps. It was the Dutch who were the first settlers in this part of America. They founded ‘New Amsterdam’ in 1625 and it became a trading post of the Dutch West India Company. In 1664 British colonists took control of the area, renaming it New York after James Duke of York who had been granted the lands. Below the map is a sketch of the city drawn from the South East, this depicts 18th century sailing ships on the river.